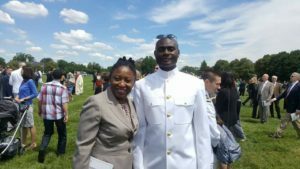 Lt C Joseph Comrie of the SKNDF poses with H.E Ambassador Dr. Thelma Phillip-Browne when he graduated with a Masters degree from the American Defence University . 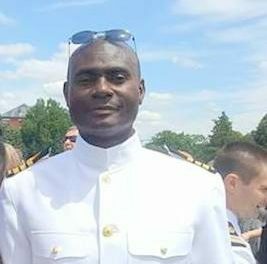 Basseterre, St. Kitts, February 02, 2018 (SKNIS): Head of the St. Kitts and Nevis Coast Guard Unit, Major J. Anthony Comrie, has been tapped to take command of the St. Kitts-Nevis Defence Force (SKNDF). Comrie’s promotion will become effective on March 01, 2018, following the announced retirement of Lieutenant Colonel Patrick Wallace at the end of this month. The imminent changes were reported by Prime Minister of St. Kitts and Nevis, Dr. the Honourable Timothy Harris, at his monthly press conference on Thursday (February 01). 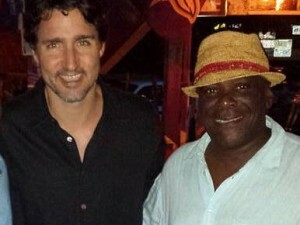 Prime Minister Harris, who is also the Minister of National Security, said Major Comrie was recommended by Lt. Col. Wallace to succeed him as the head of the SKNDF. That recommendation was accepted by the St. Kitts and Nevis Defence Board. Major Comrie has led the men and women at the Coast Guard Unit since May 2010. He has a Masters Degree from the Dwight D. Eisenhower School for National Security and Resource Strategy in Washington D.C. His 30 years of military experience have seen him successfully complete courses at a number of security-related training institutions such as the Canadian Coast Guard College, the John F. Kennedy Special Warfare Center and School, the United States Coast Guard Training Center, and the Britannia Royal Naval College. The incoming commander also has experience in the fields of counter terrorism and law enforcement. “He is well suited intellectually for the leadership [post] and I hope that his experience honed over many years, and the support he will have in the retired commander, would assist him in the new task,” Prime Minister Harris said. He also saluted the “distinguished service” of Lt. Col. Wallace and encouraged him to “continue to soldier on” in retirement in giving service to the country.